Pre-owned TAG Heuer Aquaracer Calibre 5 Automatic 300M WAY218A.FC6362 in exceptional condition. 41mm Sandblasted black titanium carbide coated titanium Grade 2 case. Black dial with luminous hands and index hour markers. Minute markers around the outer rim. Luminescent hands and markers. Date display at the 3 o'clock position. Uni-directional rotating titanium bezel. 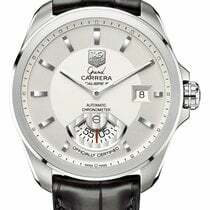 Tag Heuer Calibre 5 automatic movement with about 38 hours of power reserve. Scratch resistant sapphire crystal. Screw down crown. Solid case back. Black / yellow nylon strap with a Slip through deployment clasp. Water resistant at 300 meters / 1000 feet. Box and Tag Heuer Warranty papers dated January 2016. The picture you see is the picture of the actual watch you are buying as we sell only what we have IN STOCK!